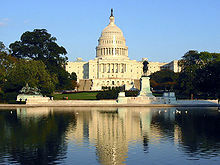 The Ninety-fourth United States Congress was a meeting of the legislative branch of the United States federal government, composed of the United States Senate and the United States House of Representatives. It met in Washington, DC from January 3, 1975, to January 3, 1977, during the administration of U.S. President Gerald Ford. This is the first congress for the currently (as of the 116th) longest serving senator, Patrick Leahy of Vermont. The apportionment of seats in this House of Representatives was based on the Nineteenth Census of the United States in 1970. Both chambers had a Democratic majority. June 10, 1975: The Rockefeller Commission issued its report on CIA abuses, recommending a joint congressional oversight committee on intelligence. Membership changed with two resignations and a disputed election. 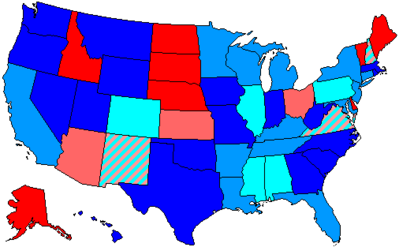 Makeup of the U.S. Senate at the start of the 94th Congress, color-coded by party. Note: The orange stripes in New York and the gray stripes in Virginia denote Conservative Sen. James L. Buckley and Independent Sen. Harry F. Byrd Jr., respectively. Senators are popularly elected statewide every two years, with one-third beginning new six-year terms with each Congress, In this Congress, Class 1 meant their term ended with this Congress, facing re-election in 1976; Class 2 meant their term began in the last Congress, facing re-election in 1978; and Class 3 meant their term began in this Congress, facing re-election in 1980. Many of the congressional districts are linked to articles describing the district itself. Since the boundaries of the districts have changed often and substantially, the linked article may only describe the district as it exists today, and not as it was at the time of this Congress. (R) Interim appointee lost election. (D) Died December 26, 1976. Successor appointed December 27, 1976 to finish the term, having already been elected to the next term. Donald W. Riegle Jr.
(D) Resigned December 27, 1976 to give successor preferential seniority. (R) Resigned December 27, 1976 to give successor preferential seniority. (R) Resigned December 28, 1976 to give successor preferential seniority. (D) Resigned December 28, 1976 to give successor preferential seniority. (DFL) Resigned December 30, 1976, after being elected Vice-President of the United States. (D) Resigned January 1, 1977 to give successor preferential seniority. House of Representatives Session Calendar for the 94th Congress (PDF). Congressional Pictorial Directory for the 94th Congress. Official Congressional Directory for the 94th Congress, 1st Session. Official Congressional Directory for the 94th Congress, 2nd Session.